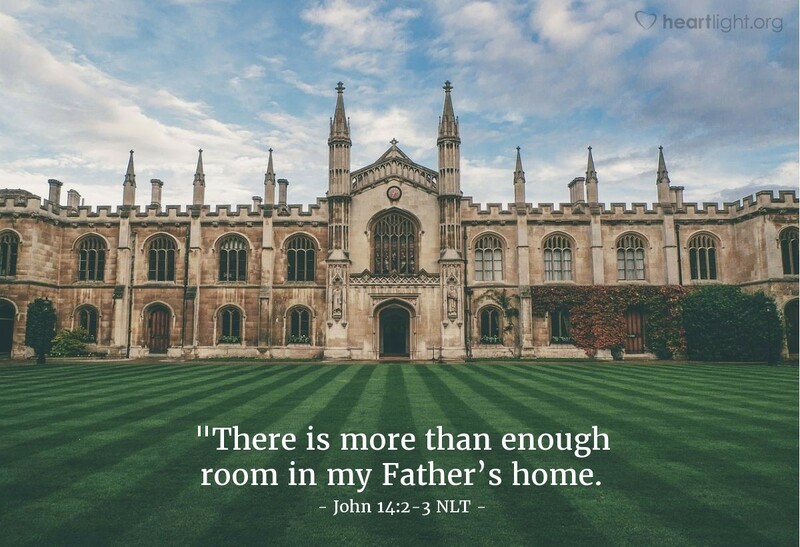 [Jesus said,] "There is more than enough room in my Father’s home. If this were not so, would I have told you that I am going to prepare a place for you? When everything is ready, I will come and get you, so that you will always be with me where I am." At this moment in his earthly ministry, Jesus is preparing to leave the earth and return to heaven. He is going back to heaven to prepare a place for his disciples (including us). When the time is right and everything is ready, Jesus promises that he will return to take his disciples, including us, to their heavenly home. The greatest blessing, however, is not just getting to go to heaven; it's getting to go to be with the Lord forever! Jesus is more than just the direction and goal of our hope; he is also the basis for it! Because of Jesus, we're going home to be with God! Loving Father and holy God, thank you for knowing my needs, my weaknesses, my dreams, and my future. I trust you completely with my future. I look forward to the day Jesus returns to bring me home to you. Thank you for the assurance that I will get to be with you forever and also with all those I love who belong to you. In Jesus' name, I pray! Amen.